Note: If you're having difficulties getting this software running in your browser give Firefox a try. It seems to work the best. They say a bit more about the technology behind all this on the Internet Archive Blog, and the Historical Software Archive's front page offers recommendations for which "ground-breaking and historically important software products" to try first, including 1.) Jordan Mechner's Karateka (top), a hot game in 1980 and the most popular item in the archive today; 2) Sierra On-Line's Mystery House (above), which gave rise more or less by itself to a vast genre of graphic adventures; 3) three adaptations of Namco's Pac-Man (one for the Atari 2600, one remade for that same console, one lawsuit-inducing knockoff for the lesser-known Odyssey2); 4) E.T. 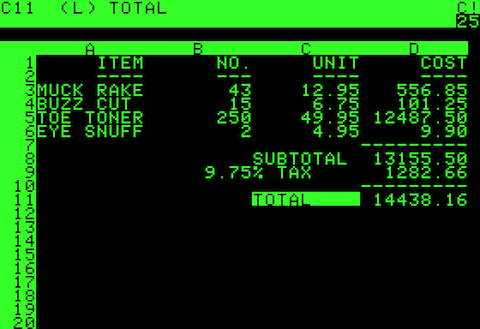 the Extra-Terrestrial, a "1982 adventure video game developed and published by Atari, Inc. for the Atari 2600 video game console;" and 5) Dan Bricklin and Bob Frankston's Visi-Calc (below), the granddaddy of all spreadsheet programs, and arguably the single application that turned computing from hobby into necessity. Or how about 6) WordStar, the early word processing program? Just click on the "Run an in-browser emulation of the program" link to fire up any of these and, if you're under about 30, experience just what computer users of the late seventies and early eighties had to deal with — and how much fun they had.